Travel to Bhutan - the land of Thunder Dragon, with its majestic mountains locked in the heart of the Himalayas is still perhaps the worlds most exclusive tourist attraction. Bhutan often reversed as the 'Land of the peaceful Dragon' is still regarded as one of the last "Shangri-La" in the Himalayan region because of its remoteness, it's spectacular mountain terrain, varied flora and fauna and it's unique ancient Buddhist monasteries. It is relatively unexplored pockets of Asia, which allows only limited number of discerning travelers to enter the country with special travel visa permits. Bhutan's isolation has resulted its culture and traditions remaining much the same for many hundreds of years. Our weekly departure allows you to experience the stunning beautiful alpine valley flanked by step slopes and terraced pastures dotted with temple. Climate : The monsoon starts in mid June and lasts untill end of September. The climate within the mountain varies greatly according to precipitations and wind conditions. In the Duars Plain and upto 1500m. The climate is sub-tropical with high humidity and heavy rain fall. 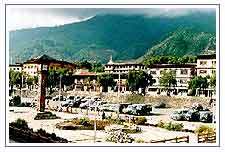 The climate of mid- mountain belt varies, such that low- lying parts of Punakha, Mongar, Tashigang, and Lhuntse have cool winter and hot summer, where as the higher valleys of Ha, Paro, Thimpu, Tongsa and Bhumthang ranging from 3,000 - 4,000m endure a temperate climate with cold snowy winter and some - what cooler summers. Clothing : Cotton and light woolen in summer ( June - Sept ). Heavy wollens and jackets the rest of the year. Take an umbrella and comfortable shoes for the monsoon. Economy : In 1995, the per capita income was estimated as US 500 with the annual growth at 5%. Although these figures places Bhutan among the least developed nations, the country is unlike others within that category as no faine, little malnutrition, food housing, exists. Over 91% of the population depends on agriculture and livestock rearing which together account for some 50% of GDP, despite the fact that only 2% of the land is arable. Money : The National currency is Ngultrum ( Nu ) 100 Chetrum = 1 Nu. Exchange rate is approximately US $ 1 - Nu 35. Indian ruees circulate at par. NOTE : Please note that all booking has to be made minium 21 days in advance & on conformation full payment has to be made at Calcutta. Rate for accompanied children, upto two yeas - free, & from 02 - 12 years - 50% of the package cost without extra bed. Maximum two children below 12 years are allowed to share room with parents. If the child is found above 12 years, the respective hotels will charge the full adult rate directly, and so communication in this regard will be entertained on the same later on. 6) Xerox copy of identification.